The town of Belmont, as in all the other towns in the Marblehead area, has had a pretty rough winter so far. There have been so many missed days of school that there is a good chance the school year will need to be extended past June 23. The snow removal law passed in November 2013 and in effect since Feb 2014 requires Belmont residents to clear the snow, ice and slush from the sidewalks around their homes by 8pm the day after the end of the storm. This law has kept people shoveling, or paying others to do it. There are has been a surge in the number of ice dams created by the accumulation of ice and snow on rooftops and gutters. Car crashes have been on the rise as two-way streets are transformed into one-way streets due to the piling up of snow along the sides of the roads. 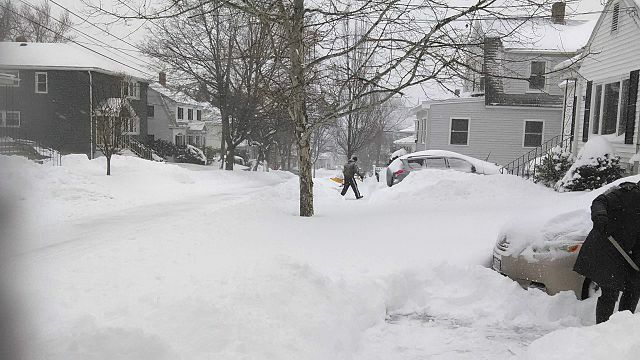 Jason Marcotte, the director of Public Works for Belmont, estimates that the expense of cleaning up from these recent blizzards will probably end up costing more than what the town budgeted for in fiscal year 2015, which was only $602,000.